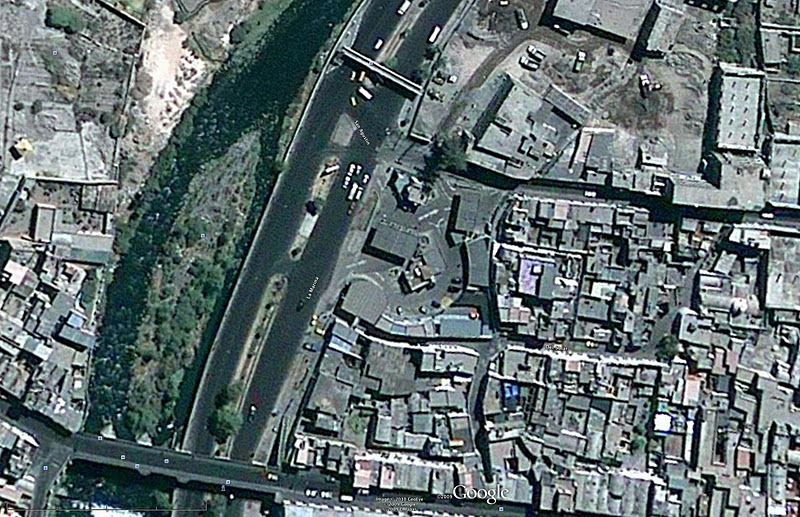 A pretty pedestrian overcrossing (POC) across La Marina Blvd in Arequipa, Peru. Three reinforced concrete hammerhead bents support two simple-span through-girder superstructures. Small shear keys keep the superstructure from moving transversely. There's a steel stairway at each end to get people on and off the structure. I like the use of yellow and green paint to give the structure an Art Deco appearance. In the U.S. we seldom paint a concrete structure because of the increased maintenance costs. Maybe the cost of labor is smaller in Peru. This POC takes pedestrians across a busy street to the east bank of the Rio Chili, which seems like an odd destination (see Google Earth Map). Perhaps its to take kayakers and fishermen safely to the river? Peru's Bridges: La Marina Blvd POC by Mark Yashinsky is licensed under a Creative Commons Attribution-NonCommercial-ShareAlike 3.0 United States License.